North Korea Says It Has Detained Another U.S. Tourist : The Two-Way State media reports that Jeffrey Edward Fowle acted "contrary to the purpose of tourism" and is being investigated. North Korea is known to be holding at least two other Americans. 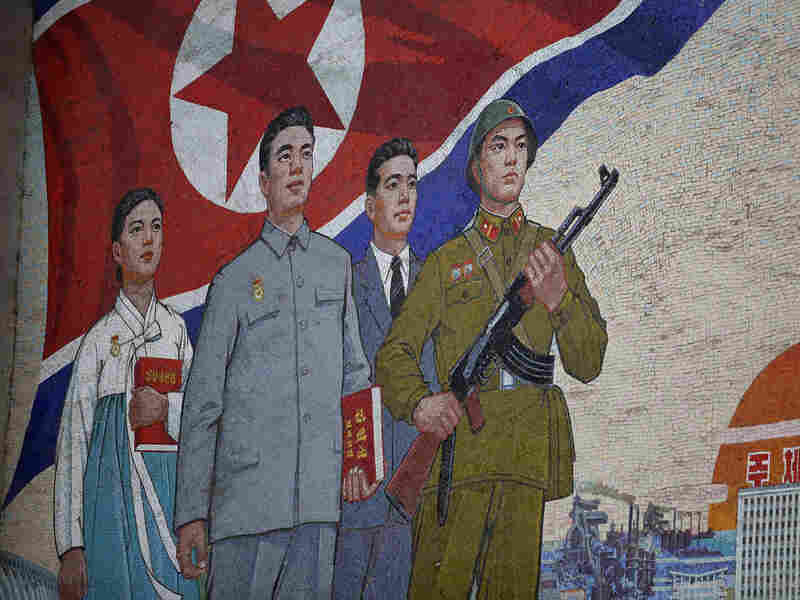 A propaganda painting is seen outside the People's Palace of Culture in Pyongyang, North Korea, in 2011. North Korean state media reported Friday that the nation has detained a U.S. tourist. North Korea said Friday that it has detained an American tourist, which if confirmed would bring the number of U.S. citizens known to be held there to three. A dispatch from the official Korean Central News Agency states that Jeffrey Edward Fowle entered the country on April 29, according to the South Korean news agency Yonhap. He then "acted in violation of the DPRK law, contrary to the purpose of tourism during his stay," KCNA continued, citing the country's official name of the Democratic People's Republic of Korea. "A relevant organ of the DPRK detained him and is investigating him." The U.S. State Department is aware of the latest reported detainment, according to The New York Times. The department has previously warned U.S. citizens against traveling to North Korea, noting that "U.S. citizen tourists have been subject to arbitrary arrest and long-term detention." At least two other Americans are being held in North Korea. A 24-year-old American tourist was detained in April for "rash behavior," as previously reported on this blog. The man was identified by state media as "Miller Matthew Todd," though The Associated Press says a tourist agency identified him as Matthew Miller. KCNA said the man entered the country on April 10 as a tourist, then tore up his visa and asked for asylum. American missionary Kenneth Bae was leading a tour group in North Korea in 2012 when he was arrested and accused of attempting to overthrow the government. Bae was sentenced to 15 years of hard labor and, as we reported this January, has made a plea for help from the U.S. government. Another American citizen was detained last year but released weeks later. Merrill Newman, an 85-year-old Korean War veteran, was visiting North Korea on a tourist visa when he was held for "hostile acts" against the state. He was accused of having committed war crimes but freed after he read an apology on North Korean state television. The U.S. and North Korea do not have diplomatic relations. As the AP notes, consular issues are overseen by the Swedish embassy in Pyongyang. North Korea is attempting to promote tourism as a way to bring foreign cash into the impoverished nation — but, the AP reports, "the country is also extremely sensitive about how visitors act while in the country."